But sometimes finding a diagnosis is like searching for a needle in a haystack, and for 25-30 million Americans, answers don't come at all. For 15-year-old Maggie Hall of Cookeville, Tenn., and her family, finding the cause of her rapidly declining vision and worsening muscle weakness took seven years. 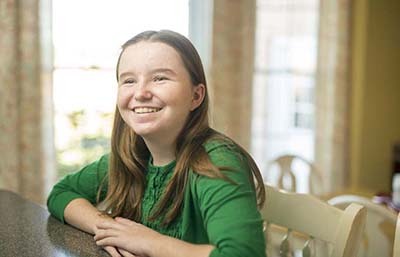 But with the help of Vanderbilt University Medical Center's (VUMC) Undiagnosed Diseases Network (UDN) team, Maggie and her family now know where her condition originated -- the NADK2 gene. There is currently no cure, but just knowing what they're dealing is a relief, said Maggie's father, Mike. VUMC's UDN is part of a clinical research initiative of the National Institutes of Health (NIH). VUMC is one of seven sites around the country selected in 2014 to participate in a clinical network to develop effective approaches for diagnosing hard-to-solve medical cases (undiagnosed diseases). The network's purpose is to bring together clinical and research experts from across the United States to solve the most challenging medical mysteries using advanced technologies. An undiagnosed disease can be a new disease or a rare presentation of a rare disease, said John Phillips III, MD, David T. Karzon Professor of Pediatrics, who is co-principal investigator of the Vanderbilt UDN with John Newman, MD, Elsa S. Hanigan Professor of Pulmonary Medicine, and Rizwan Hamid, MD, PhD, director of the Division of Medical Genetics and Genomic Medicine at VUMC. "Patients who apply have not been diagnosed, and it's not because they don't have something. It's because no one has seen it before," Phillips said. In Maggie Hall's case, a faulty NADK2 gene is the source of neurologic and metabolic abnormalities that began in Maggie's childhood. This gene is needed to produce NADPH, which is crucial for metabolism of some amino acids, fats and carbohydrates. Severe NADK2 deficiency is extremely rare (there are only three reported cases) and it is usually fatal in early childhood. Fortunately, Maggie has incomplete or partial NADK2 deficiency and she is much less severely affected than others. This is because she has an unusual type of mutation that unexpectedly allows her NADK2 enzyme to retain some activity. "The fact that we have a diagnosis has eliminated the stress of worrying constantly about what this is. We can focus on moving forward and being able to help her," her father said. To be accepted into the UDN, patients apply through an online patient application portal called the UDN Gateway, rather than through individual clinical sites in the network. Since September 2015, 161 applications have been referred to VUMC and 47 families have been accepted into the program, resulting in 14 completed visits at Vanderbilt for a thorough in-person clinical evaluation. Patients consent to a blood draw and several months of analysis of DNA sequencing before their visit occurs. To date, eight diagnoses, including Maggie Hall's, have been achieved through the Vanderbilt program. The UDN grew out of the success of the Undiagnosed Diseases Program at the NIH Clinical Center in Bethesda, Maryland. Since its 2015 launch, the UDN has reviewed more than 1,200 applications from patients around the world. At all seven sites, more than 490 patients have been enrolled for extensive genetic testing and a 2.5-day visit for a clinical evaluation. Phillips said the goals of the UDN are to improve the level of diagnosis and care for patients with undiagnosed diseases and facilitate research into the mechanism of these diseases by creating a collaborative research community. The network also strives to better understand the impact of the diagnostic process on patients and families who have long awaited an answer. In Maggie's case, her diagnosis was not at the end, but the beginning, and it led to a new idea about how to treat her. "We worked together with scientists in the Netherlands and Wales to use her diagnosis to devise a treatment specifically tailored to her condition -- an example of precision medicine," Phillips said. Maggie's referring physician, Tyler Reimschisel, MD, associate professor of Pediatrics, is working with the UDN to implement this therapy in Maggie. Then a "wrap-up document" is sent home to the patient's referring provider. The document and what they learned during their UDN visit might identify improved options for optimal patient management, said Anna Bican, the Vanderbilt UDN study coordinator. "Hopefully, by sharing what we find -- both with the home medical teams and the scientific community at large -- other researchers will take up the baton to find treatments for these new diseases," she said. Phillips said that an important long-term goal of the UDN is to form a collaborative research team. One way the UDN does this is by identifying and then connecting with other researchers who are interested in further studying these new diseases and developing possible treatments for them, as in Maggie's case. Since the UDN researchers can't be the permanent medical home for patients, some of who come from great distances, the UDN tries to identify local physicians and possibly scientists who have expertise in treating patients with the rare or new disease that was identified through the UDN research study. "Ultimately, the ongoing care and treatment of patients who have come through our study will have to rest in the hands of their skilled local doctors," Phillips said. Maggie, a sophomore at Cookeville High School, started wearing glasses when she was 5, followed by weakness, exercise intolerance and worsening vision. When she was 8, basically over one day's time, her vision decreased significantly. In 2014, she had intermittent episodes of muscle weakness so debilitating she required a wheelchair, tingling in her calves and numbness in her toes. She was losing weight and needed help standing up. "That was a very tough year," her father, Mike Hall, said. Maggie has some peripheral vision left, but no central vision. Over the past couple of years she has put on some muscle weight and has had fewer episodes of muscle weakness and fatigue. "It seems like her disease has leveled out," he said. Following her diagnosis with the UDN in June, it was determined that Maggie has a genetic block in making NADPH. To try to overcome this block she has begun taking a compound called NADH to try to boost her production of more NADPH from her remaining NADK2 enzyme. "We hope that this will improve her metabolism of amino acids, fats and other things that are building up in or are missing from her body due to her NADK2 deficiency," Phillips said. "She continues to do well and is keeping her strength up," Mike Hall said. The clinical sites in the Undiagnosed Diseases Network (UDN) will receive $43 million over four years and will contribute local medical expertise and conduct clinical evaluation and scientific investigation in cases that involve patients with prolonged undiagnosed conditions. For more information about the UDN, including how to apply, visit http://commonfund.nih.gov/Diseases/index.